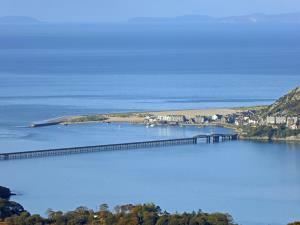 Cycling - Barmouth & the Mawddach Valley at Barmouth/Abermaw01341 280787workCycle RouteWith the development of Trans Wales cycle routes, Barmouth has become an ideal centre for a cycling based holiday. The dramatic beauty of North & Mid Wales offers a vast array of cycling opportunities for all types of cyclists. The National Cycle Network 'Lon Las Cymru' offers a 240 - mile cycling adventure through Wales and Barmouth is ideally situated on route 8. The 'Traffic-free trail from Barmouth to Dolgellau along the Mawddach Estuary is one of the most spectacular rides in Wales. With wonderful open views north to wooded hills rising 1000 ft, up from the water's edge. This 10-mile ride starts with a crossing of the splendid wooden Barmouth Viaduct and follows the old railway track into the heart of Dolgellau. There is an excellent refreshment shop at the George III Hotel at Penmaenpool. For the more adventurous, a number of mountain bike routes have been developed in the Coed Y Brenin Forest north of Dolgellau. With the development of Trans Wales cycle routes, Barmouth has become an ideal centre for a cycling based holiday. The dramatic beauty of North & Mid Wales offers a vast array of cycling opportunities for all types of cyclists.